This is one of my favorite games. This works for reading, math or anything you can write on a card with an answer (great for spelling words, sight words, letter sounds, math facts, states/capitals, etc). The pictures are of our spelling words for the week. Kids get in groups of three or four. One student does not have a fly swatter, while the others each have one. The student without a fly swatter is the reader. Spread the words (or math fact cards, or whatever) on the ground. The reader reads any word. The other kids try to be the first to swat the word. Whoever swats the word first keeps the word. After the words are gone, the fly swatters get passed to the left. If you don’t have the fly swatter, you become the reader. 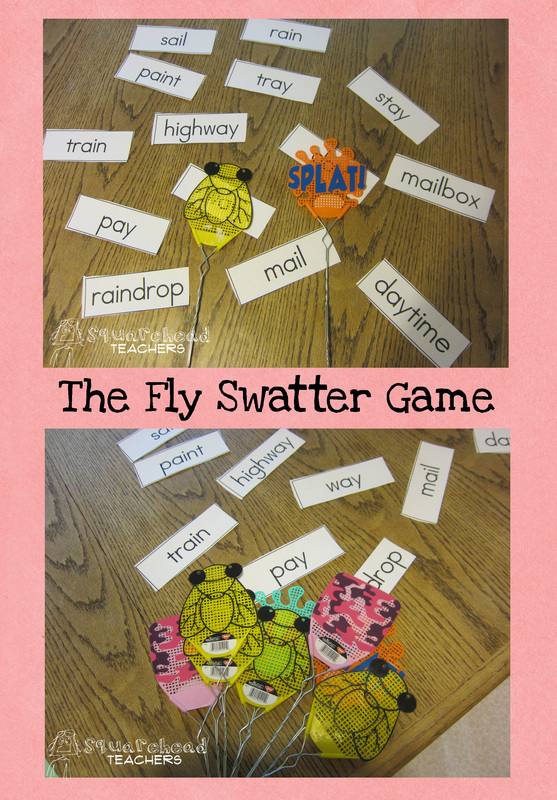 Be sure to set up rules before the game that if someone intentionally swats another student with the fly swatter they sit out a round, or whatever your class rule would be. For a whole class experience put the words on the board and give each team one fly swatter. Kids love this game! This entry was posted in Addition, Division, Games, Language Arts, Letters/Sounds, Math, Math Games, Multiplication, Social Studies, Subtraction, Word Study/Spelling and tagged Children, Education, Elementary School, Games, Homeschool, Kids, language arts, Math, sight words, Social Studies, spelling, subtraction, Teacher Resources, Teachers, Teaching by Squarehead Teachers. Bookmark the permalink. I play a version of this game with my students – they love it!